From chef’s coats and cut-resistant gloves, to bar towels and coffee cups, you’ll find what you need to enable kitchen staff to get the job done. Properly supplying everyone from the prep cook, to the bartender, to the hostess will mean a smooth and efficient operation.and efficient operation. Versatile in its uses, cheesecloth is the perfect solution for many kitchen needs - from preserving cheeses and straining sauces, to wrapping meat and poultry. Beyond food prep, cheesecloth is also ideal for polishing stainless steel and keeping kitchens sparkling clean. For take-out service, outdoor events, or anywhere it is impractical to wash glasses, disposable cups are the answer. Foam and paper cups are ideal for hot beverages; while plastic, paper, and foam can all work for chilled beverages. They are available in a wide variety of colors, sizes, and styles, to suit your needs. The right glove will protect both food and hands in the kitchen. Disposable gloves come in a variety to styles and sizes and make it simple for employees to follow sanitation protocols when preparing food. Cut resistant gloves help eliminate workplace accidents with knives and other sharp objects. Heat resistant protection will keep hands and arms safe when reaching into a hot oven. 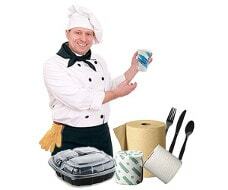 Put a layer of protection between your employees and possible injury with a selection of foodservice gloves. Help protect chef’s and server’s hands from burns. Safely handle hot pans, pots, and dishes with quality commercial oven mitts and gloves. From the corner deli to fine dining, food picks can be a versatile tool. Use them to secure a food presentation or to designate between similar foods. Available in different sizes, styles, and colors to fit whatever is on menu. Trussing meat and poultry requires twine. This simple kitchen staple is also great for securing bakery boxes and other foodservice bags and containers. Strong and durable, twine meets a variety of kitchen needs.